Classical arguments about the legitimate use of force have profoundly shaped the norms and institutions of contemporary international society. But what specific lessons can we learn from the classical European philosophers and jurists when thinking about humanitarian intervention, preventive self-defense or international trusteeship today? The contributors to this volume take seriously the admonition of contextualist scholars not to uproot classical thinkers' arguments from their social, political and intellectual environment. Nevertheless, this collection demonstrates that contemporary students, scholars and policymakers can still learn a great deal from the questions raised by classical European thinkers, the problems they highlighted, and even the problematic character of some of the solutions they offered. The aim of this volume is to open up current assumptions about military intervention, and to explore the possibility of reconceptualizing and reappraising contemporary approaches. Introduction: the enduring relevance of classical thinkers Stefano Recchia and Jennifer Welsh; 1. Intervention in European history, c.1520-1850 David Trim; 2. War in the face of doubt: early modern classics and the preventive use of force Ariel Colonomos; 3. Vitoria: the law of war, saving the innocent, and the image of God William Bain; 4. Grotius, Hobbes and Pufendorf on humanitarian intervention Richard Tuck; 5. John Locke on intervention, uncertainty, and insurgency Samuel Moyn; 6. Intervention and sovereign equality: legacies of Vattel Jennifer Pitts; 7. David Hume and Adam Smith on international ethics and humanitarian intervention Edwin Van de Haar; 8. Sovereignty, morality and history: the problematic legitimization of force in Rousseau, Kant and Hegel Pierre Hassner; 9. Revisiting Kant and intervention Andrew Hurrell; 10. Edmund Burke and intervention: empire and neighborhood Jennifer Welsh; 11. The origins of liberal Wilsonianism: Giuseppe Mazzini on regime change and humanitarian intervention Stefano Recchia; 12. J. S. Mill on non-intervention and intervention Michael Doyle. 'Arguments about whether or not military intervention is justified overshadow much of today's international agenda. This authoritative collection, encompassing the reflections across four centuries of the major luminaries of European thought, will greatly enrich those debates, as well as documenting an intellectual history in its own right.' 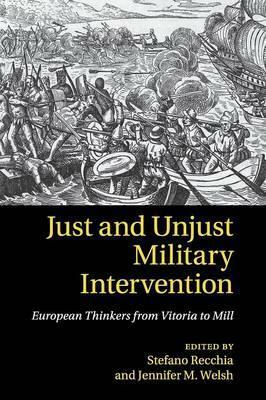 Ian Clark, Aberystwyth University 'In this fascinating collection of essays, a superb group of scholars illuminate classic European debates about military intervention by thinkers such as Hobbes, Grotius, Vattel, and Mill. This absorbing book provides a valuable philosophical and historical background to enduring arguments about intervention, sovereignty, international law, and human rights.' Gary Bass, Princeton University, New Jersey 'Writings on intervention often have a 'shock of the new' quality about them, as though the dilemmas surrounding contemporary humanitarian intervention are novel in international history. This excellent collection provides some much needed perspective, showing that reasoning about just and unjust intervention has a long and nuanced history. Recchia and Welsh have assembled an outstanding group of contributors who not only introduce the reader to thinkers from Vitoria to Mill but also place their thought in the distinctive social and political contexts in which they were written. This book will be mandatory reading for anyone interested in the legitimacy of international intervention, past and present.' Christian Reus-Smit, University of Queensland 'Beyond these uncertainties, there is enough scope to revisit the views of classical political thinkers in light of contemporary debates on intervention, which they often echo and enlighten. Mill's thoughts on (and general reluctance towards) intervention are extraordinarily relevant in view of the debates which have raged over Kosovo, Iraq, Afghanistan and Libya. That consideration is enough to fully justify the project, and the resulting book is, by any measure, a remarkable accomplishment.' Gilles Andreani, Survival '... offers a series of finely worked discussions on how figures such as Francisco de Vitoria, Hugo Grotius, Emmerich de Vattel and John Locke, among others, tackled the moral issues raised by the use of force to rescue oppressed peoples from the predations of their own government. ... Setting a gold standard for edited collections, Just and Unjust Military Intervention will surely and deservedly be seen a landmark text in its field.' Cian O'Driscoll, International Affairs "Beyond these uncertainties, there is enough scope to revisit the views of classical political thinkers in light of contemporary debates on intervention, which they often echo and enlighten. Mill's thoughts on (and general reluctance towards) intervention are extraordinarily relevant in view of the debates which have raged over Kosovo, Iraq, Afghanistan and Libya. That consideration is enough to fully justify the project, and the resulting book is, by any measure, a remarkable accomplishment." Gilles Andreani, Survival "... offers a series of finely worked discussions on how figures such as Francisco de Vitoria, Hugo Grotius, Emmerich de Vattel and John Locke, among others, tackled the moral issues raised by the use of force to rescue oppressed peoples from the predations of their own government. ... Setting a gold standard for edited collections, Just and Unjust Military Intervention will surely and deservedly be seen a landmark text in its field." Stefano Recchia is University Lecturer in International Relations at the University of Cambridge. Jennifer Welsh is Professor in International Relations at the University of Oxford and Co-director of the Oxford Institute for Ethics, Law and Armed Conflict.